Establish a 400-word vocabulary in nonverbal children and lay the foundation for communicating with pictures and signs. Children learn the new vocabulary in a variety of formats so they truly comprehend the words. 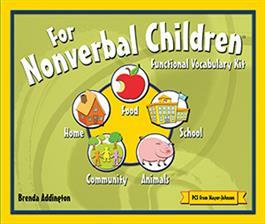 The vocabulary is divided into five themes: Home, Community, Food, School, and Animals. Each theme consists of eight units and each unit teaches 10 functional vocabulary words (total of 80 vocabulary words in each theme). Identifying Labels- Unit vocabulary is introduced with individual picture vocabulary cards. Students identify labels by pointing to single pictures. Learning Gestures & Signs- Photographs and descriptions for sign language are provided for each vocabulary word. Listening Critically- Students answer questions about the vocabulary words when given two-picture choices. You have a choice of using simple or complex foils. Fill-Ins- Students answer fill-in questions using simple or complex two-picture choices. Answering Yes/No Questions 1 and 2- Use two-picture choices and yes/no icons to teach yes/no responses. Simple Pointing with a Grid- Students practice pointing to vocabulary items on a grid. Classifying- Students identify vocabulary by attributes, functions, and categories. Enrichment and Extension Activities- Use music, literature, and hands-on activities to expand vocabulary.